Hello friends! I have to admit to you, I am having a bit of writer's block. Too many Oreo truffles and holiday parties will do that to you. 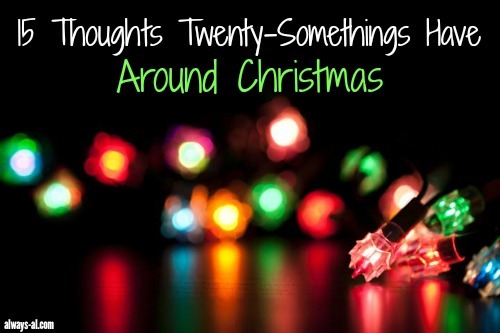 I thought it would be fun to write down a collection of thoughts that twenty-somethings may or may not be having this Christmas season. 1. Should we send out Christmas cards? Is that a thing? Can't I still be included on my parent's cards? 2. I wish it would snow for Christmas, snow is magical! 3. Is that supposed to smell like burning? 4. ELF IS ON! I LOVE THIS MOVIE! 5. My bank account is looking a little more sparse than normal. This must be wrong. Nope. I just bought all the things. 6. Does anyone actually like egg nog? 7. Soooo how many drinks are socially acceptable at the office holiday party? 9. Seriously glad I invested in these cozy pajamas and slippers. Totally winning. 10. It is way harder to hang lights on a house than I originally thought. Props to you, Mom and Dad. 11. I really should market my baking skills. These Oreo truffles are on point! 12. Everyone is getting coupon books this year, because this girl is broke as a joke. 13. You mean it's not socially acceptable to wear my ugly sweater around all the time? 14. I have eaten so much candy and cookies. Diet starts tomorrow. 15. Peppermint mochas for all! Lots of love and Christmas cheer to all! I definitely have all of these thoughts! I ate cookies for dinner last night, so, really feeling #14 right now! Great post! I read this literally laughed out loud - because girl, I think about ALL of these hahahaha!!!! Totally pinned this because others need to find and read this. I love this list. I am with you on all of it except I love eggnog and snow. I'll also trade the peppermint mochas for a caramel brulee latee! I think everyone has these thoughts!! :) Thanks for stopping by! I am 21 and couldn't agree more with all of them especially my peppermint mocha's they are life. oh man, these are so funny! especially 1, 2, 5, 6, 7, and 13....i have the most hideous vest and want to wear it everywhere. i'm stopping by from the oak and oat's linkup and i'm sooo glad you posted this!